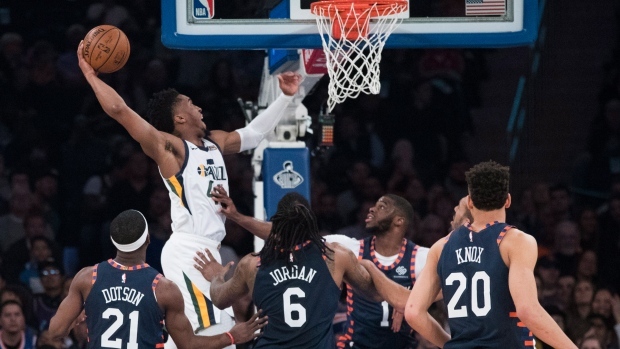 NEW YORK — Donovan Mitchell and Joe Ingles poured in shots from the outside and Rudy Gobert couldn't miss from inside. "We're doing a lot of things great on offence and defence," Mitchell said. Ingles made six 3-pointers and also scored 18, while Mitchell made five 3-pointers as the Jazz finished 20 of 42 (48 per cent) from behind the arc, tying a franchise record for makes. That was a rather soft portion of their schedule and it got even softer with a game against the NBA-worst Knicks, who the Jazz had already clobbered 129-97 at home on Dec. 29. Utah trailed for less than a minute of this one and was shooting 63 per cent through three quarters, a number that dropped to 56.5 by the finish only because the best players were on the bench for most of the fourth quarter. Hezonja's 3-pointer gave the Knicks a 3-2 lead, but Utah answered with nine straight points and never trailed again. The Jazz led 39-25 after one, shooting 65 per cent, pushed it to 50-29 on Ingles' 3-pointer in the second, and the lead stayed in the 20s for the rest of the half. "They just swung the ball around and were hitting shots," Knicks centre Mitchell Robinson said. "We were close enough to get into their airspace, but they still put them up and they made them. You've got to give them their props. They can shoot."